The Checkpoint IRS Response Library from Thomson Reuters allows you to quickly respond to IRS notices confidently and provide IRS representation for your clients in many types of engagements. You can quickly search by notice number or topic to respond to the IRS and clients using a variety of tax resolution tools, including scripts, response documents and practice aids. The Library includes expanded coverage of penalties including first time penalty abatement and taxpayer advocate services. IRS notices continue to be on the rise as the IRS shifts to enhance the taxpayer experience through the creation of online accounts; where taxpayers can independently resolve their issues. If your client receives a notice, they are likely to turn to you as their trusted advisor for guidance. 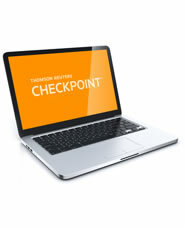 With Thomson Reuters Checkpoint IRS Response Library, you can simply search by notice number or topic to respond to the IRS and your clients using a variety of tax resolution tools. These tools include scripts, response documents and practice aids. In addition, you can confidently generate a step-by-step workplan so that you can project billable hours and resolve the issue efficiently and effectively. Step-by-step Workplans, from Beginning to End, that provides insight into the IRS’ internal procedural steps. Whether your client just received a notice or you’re looking to appeal an IRS decision, you’ll get specific guidance and instructions to handle the issue appropriately. Comprehensive IRS Notice and Form Database — Quickly look up a sample Notice or Form to see what your client received, with guidance on what it means and what steps to take. Issue-specific Questionnaires for Gathering Facts — Outline exactly what questions to ask to get to the point and eliminate back and forth with the IRS and your clients. Sample documentation for responding to the IRS — Responses and sample document sets, including forms, letters, analysis tools and workpapers, created by former IRS employees. Powerful Search Tool — Search by issue, notice/form name or number, or keyword to find answers fast. Projections for Billable Hours — Tools to help you effectively project billable hours. Links to Primary Law — Verify recommended response against IRS Code, Regulations and Publications.